On the end of the Wings Neck Peninsula in Buzzards Bay. Privately owned. 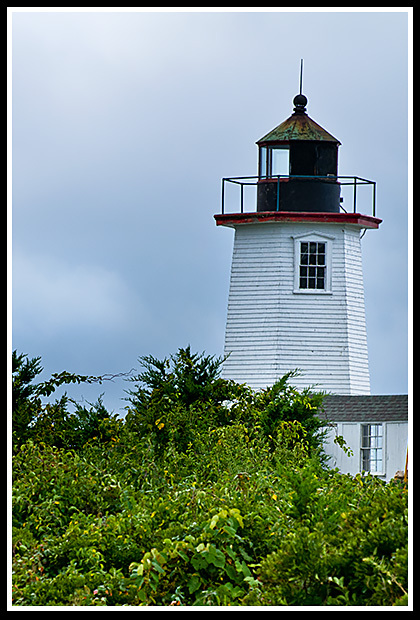 The original lighthouse was built in 1848 on twelve acres of swampland. President Harding once had to anchor his Presidential yacht by the station due to bad weather. The next morning Keeper Eldredge gave the President a "twenty-one clang salute" with the fog bell. Two brothers tended the light; George Addison Howard as Keeper in 1921, and his brother William as his assistant. They were credited in the area for performing many rescues, including 5 from an overturned boat in 1931, and saving eight lives in 1932. By the end of his career, William Howard himself was credited with saving at least 37 lives. The Keeper’s dwelling from Ned’s Point Light was brought over to Wing’s Neck Light in 1922. The story goes that the last Keeper, remained in the dwelling as the barge towed it to Wing's Neck and cooked a last breakfast for himself. The property was completely renovated in 2003 as a private residence and is now available for weekly rentals year round. Pocasset is a residential community that hosts a variety of boating events coordinated by the Buzzards Bay Yacht Club. There is also the Pocasset Golf Club there as well. Wings Neck lighthouse can be viewed at the end of a small cul-de-sac, and is available year round as a rental for lighthouse enthusiasts. There are plenty of quiet beaches between Bourne and Pocasset, as most vacationers simply drive by on route to the main towns and cities in Cape Cod. Be wary that parking is usually limited in many of these beaches, and it's advisable to arrive early to relax and enjoy. For those with familes and needing a lifeguard, Hen Cove Beach is another quiet jewel with calm waters and a defined swimming area, or try Electric Avenue Beach which is on the edge of Buzzards Bay. This small beach doesn’t get too crowded, and there's a children's playground. You'll even see the electric windmill hovering above rooftops. In Bourne, Monument Beach is a popular destination and is located just before the entrance to the Cape Cod Canal. It’s a good-sized quiet beach, is very popular with local windsurfers, and has a docking area for boaters. Visitors can also enjoy the Concerts in the Park series over the summer, and famous Scallop Festival in September. In Pocasset is Barlows Landing, off Route 28, which is a mid-sized quiet yet spacious beach on Pocasset Harbor. It has rock jetties, nice sand and lots of boats for your viewing pleasure. This is one of those beaches few outsiders know about, so you'll find plenty of room to spead out and relax. For those looking for a picture perfect quiet setting, without amenities (although lifeguards are posted), try Picture Lake, with its setting amongst pine trees for lots of sun and shade. You can also head down to Old Silver Beach in North Falmouth about 4 miles from Pocasset, or any of Falmouth’s many beaches. Follow US Route 6 to the Bourne Traffic Rotary towards Cape Cod. From Route 28 South, heading towards Pocasset, turn right on Barlows Landing Road at a sign that reads “Pocasset 1- Barlows Landing –Wings Neck 3”. After crossing Shore Road, bear right on Wings Neck Road and follow it to its end. The lighthouse will be to your right at the end of a small cul-de-sac.